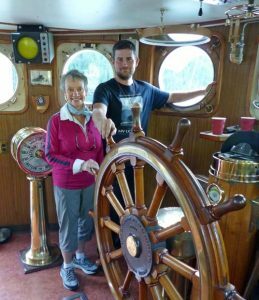 During a two-day maritime cruise to a remote village on the West Coast of Vancouver Island, British Columbia, we briefly sampled a very different way of life. Our adventure started with a full day’s travel from Vancouver to Gold River. This once-thriving logging town is surrounded by steep hillsides covered in old-growth Douglas fir and Western hemlock. 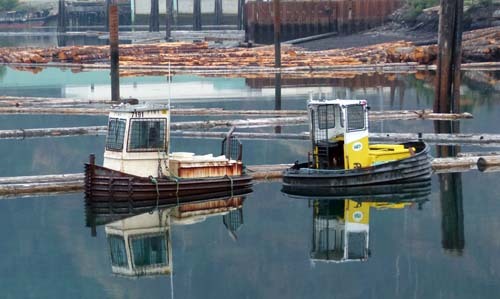 The pulp mill closed in 1998 and nowadays this close knit community depends on tourism and sport-fishing. We stayed overnight in Gold River and were ready to embark before sunup. 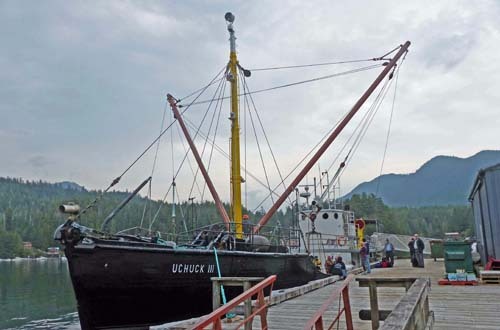 The MV Uchuck III departed the wharf promptly at 7:00 am for its journey up Nootka Sound to Kyuquot. 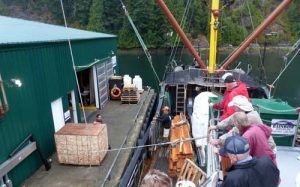 Since 1982 every week this vessel has delivered groceries and supplies to logging camps, fish farms, fishing lodges and small settlements on the way. We were along for the ride while the dedicated crew worked hard at loading and off-loading goods and equipment. This was a one of a kind boat. In 1942 it started life as a wooden-hulled Mine Sweeper. It was substantially refitted in 1955. Mast derricks, lifeboats, cargo winches and two 500 hp diesel engines were installed. After that it received regular upgrades. Today, the Uchuck sports two big yellow funnels, outside seating upstairs under a covered canopy, comfortable seating downstairs and a galley kitchen from which emanated the best of aromas. 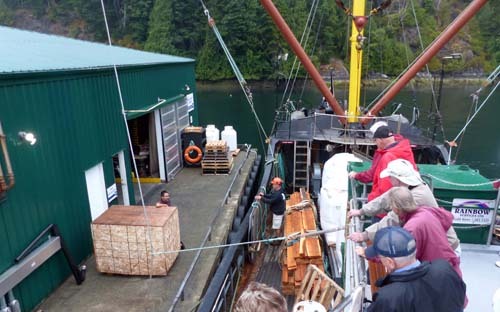 Accompanying us were about 30 other tourists and around 65 tons of general cargo. Just as the light was breaking through the low clouds, Captain Spencer sounded a single loud blast on the ship’s whistle. Leaving the harbor, we passed a group of seagulls perched on a log boom, a heron performing its morning ablutions and two little tugboats nestled side by side. Once underway, Captain Spencer was happy to welcome visitors to the wheelhouse. This control centre featured various electronics, a huge brass trimmed wooden steering wheel and, in pride of place, a brass antique maritime telegraph that enables the Captain to transmit orders to the engineer. Our first stop was at a salmon farm on Muchalat Sound where the fish were jumping hither and yon. The Captain and his crew expertly moored the vessel. In challenging conditions this can be a real test of skill. Then everyone watched the First Mate off-load several skids of freight. Operating the boat’s winch and cable system is no mean feat and is the First Mate’s specialty. The male passengers, in particular, were awed by this procedure. Setting off again, we sat back and enjoyed the pristine wilderness … the craggy islets, the wooded mountainsides sweeping upwards from sea to sky, the mile upon mile of uninhabited coastline, the sea lions huddled one atop another on a rocky outcrop, the lone black bear foraging for food along a pebbled beach, the bald eagles sweeping and soaring above and far away a pod of whales breeching. Always on the lookout our Captain spotted a raft of sea otters. He carefully circled around these cuddly-looking creatures as they tumbled and played in the water, their thick fur keeping them warm in the chilly waters. 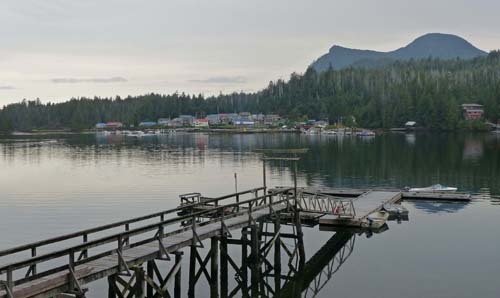 Other stops included the Kendrick Logging Camp where more supplies were delivered and the Newton Cove Fishing Lodge where a number of passengers disembarked for an overnight promotional visit. Until now we had cruised through relatively calm water but leaving sheltered Esperanza Inlet we headed to the open Pacific Ocean. It was a cloudy day and the sea was relatively calm with just little rollers and a light wind. Chugging along at a steady 12 knots, we arrived in Kyuquot, 10 hours and 70 nautical miles later. This isolated community with a population varying from 100-300 is only accessible by air or water. It is made up of nine islands including Walters Island, where we stayed, and Houpsitas on the mainland, the traditional winter home of the indigenous Kyuquot people. Immediately upon docking, several dedicated ocean kayakers headed south on a three week paddling expedition. 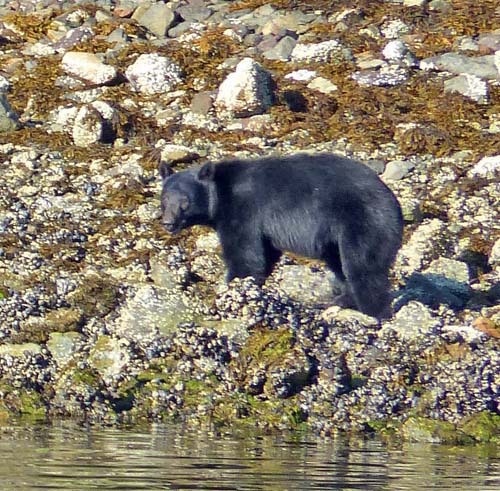 The rest of the group lodged either with local residents or at Kyuquot’s only hotel. To reach our cabin we walked along a raised boardwalk that led to a narrow winding trail abutting the shoreline. Trees towered overhead and unpaved pathways gave access to waterfront homes. We just had time to get settled before enjoying a family style dinner. Hungrily, we tucked into a roast pork casserole and then gobbled up a plate of yummy chocolate brownies. Our appetites satisfied, we sat on the hotel’s patio awhile. Ripples lapped against the beach as a small boat owner putt putted homeward across the water. 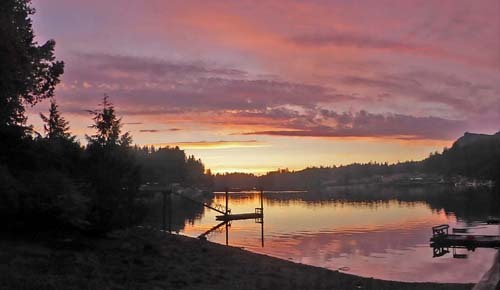 A rosy glow lit up the sky. It was so peaceful far away from the noise and lights of the city. We had a wonderful night’s rest. The next morning dawned bright and clear. Elaine and Julie, the two galley “slaves”, served a delicious breakfast on the boat. They did themselves proud. There were pastries, fresh fruit and yogurt, eggs, sausages, a “morning wife saver”, tea and coffee. 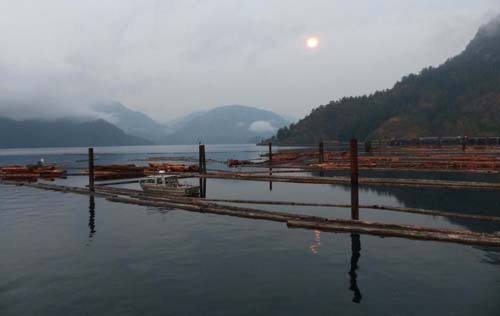 We left Kyuquot early to make a detour to a logging camp at the end of Kashutl Inlet to drop off two pallets of provisions for the lumberjacks in residence. There was not a cloud in the sky. We placed a couple of chairs in a sunny spot on the outdoor deck and reveled in the pure fresh air and the stunning scenery. Heading back to Gold River we called in at several more fish farms, all of which are operated in partnership with the First Nations people on whose traditional territories the farms are located. Twelve hours later, we walked down the gangway and back on to solid ground. Our special thanks to Captain Spencer, First Mate Adrian, the crew, Elaine and Julie for allowing us to come aboard the historic Uchuck III on its regularly scheduled run to Kyuquot. It was a once in a lifetime experience.